ES Student-Led Conferences coming soon! Seniors have begun receiving exciting news in the form of university acceptances for next year. There is more on this in the College Update section of the newsletter. Maintenance and repair work on our pools has been completed and students are now back in the pool for PE classes, as well as during after school. Family swim will re-commence on April 7th - details to come. Teachers and students are preparing for the next round of MAP testing in grades 2-9 to take place soon after we return from the break. The PTO is preparing for a 40th birthday celebration for the school on May 5th. Students K-8 are preparing for their Student Led Conferences in May. There is more information on SLCs in this newsletter. With all this, and more, going on it is hard to imagine that we have also been able to find the time to put in the long hours needed to prepare the school’s accreditation self-study report (more on that below). One of the benefits of bringing students, parents and staff together to do the accreditation report is that it has encouraged us to re-examine what we stand for as a school and what kind of learning environment we want to create for our kids. It has encouraged me to look more deeply at what we mean when we say that we aim to foster independence in our students. To that end I have been reading a recently published book on the topic, The Self-Driven Child: The Science and Sense of Giving Your Kids More Control Over Their Lives, by Bill Stixrud. I discovered the book via this NPR interview with Dr. Stixrud. Stixrud’s struggles with his daughter’s school-related stress struck a chord with me as Renee and I faced a similar situation with our own daughter before we went overseas. Indeed, removing her from the highly competitive environment of her high-flying Ontario public school was one of the great benefits of moving overseas. The international school she eventually graduated from in Bolivia had a much more holistic approach to student life and learning, much like AISB’s, and allowed her to balance her social-emotional and academic growth. I have gathered a few excerpts from the book to share with you all, here. If you enjoy these let me know and I can share more in future newsletters. The last session of after-school activities for the year will start on Monday April 16, and will run for 6 weeks. This year, the “FreeZone Tuesdays” were introduced in the after-school activity programme, and they have been a great hit with the students. One other highlight of the last quarter’s activities was zumba, which was run by a parent. We welcome and highly encourage more parents to get involved; either to offer or assist with an activity. Recommendations for after-school activities, especially for secondary students, are especially welcome! Please do not hesitate to get in touch with Ms. Yaa Obeng (yobeng@aisbmali.org) if you have any questions. Enjoy some original poetry from the MS French Advanced class, a product of AISB's Mother Tongue Week. It’s really happening: AISB’s Re-Accreditation Self-Study is almost complete, our Objectives for growth and improvement (below) are ready to be submitted to MSA for the technical review, and we have applied to MSA to secure our preferred dates for the Team Visit next year. Yes! Go team! Following a three-hour brainstorming and discussion workshop on February 19, members of the Action Teams are now hard at work on the Action Plans. Drafts will be reviewed by faculty this coming Thursday, and then reviewed a second time to ensure their alignment with AISB’s strategic plan goals. We expect to have a complete draft of the Self-Study ready to share with the community sometime around the end of April. And then we celebrate! Once again, we thank sincerely all the members of the AISB community who have contributed to this effort. That includes upbeat committee members --parents, students and educators-- with too much going on, who somehow still find the energy to work together for the school’s future; thoughtful student focus group participants, bringing their insight to the process at the grassroots; grimly determined action-plan writers working away in the shadows; interested individuals with good ideas, who get involved in some aspect of the process; and busy people on their way somewhere, who nevertheless take the time to share a suggestion and cheer the process on. We appreciate you sincerely. From the moment you enter the classroom, your child will be in charge of leading you through the student-led conference. It is important that you follow his or her lead, as the timing of the student-led conference is limited. Students will have a check-off list to guide you through the conference and will be responsible for sharing their learning. This is the most exciting part … you are not in charge! As soon as you and your child enter the classroom, your child becomes the teacher and you become the student! Your child will have practiced how to share reflections of their work, share their growth in various subjects, and might even demonstrate new skills they have learned. Please ask your child questions to help guide them in sharing more about their learning. There is a lot for you to see on this special day, so please ensure your child has your full attention. Please respect that another family may be in the room at the same time as you, so please save socializing with others until after the conference. Please make other arrangements for younger siblings, and turn cell phones to vibrate. Parents are always welcome to schedule a face to face meeting with teachers at any time. Contact your child's teacher directly, or call Ms. Oumou to set up a meeting. During the student-led conference, your child’s teacher will be in the classroom. Teachers will provide students with support and assist them as needed. This is an opportunity for parents and teachers to see and hear how much students have learned this year! Please remember this is not a traditional parent-teacher conference – teachers will be present and active in the classroom but will not be leading the conference. Teachers will interact with different students and families as needed. Once you arrive, your child will be leading you through the conference. You will see and hear what learning your child has learned in Reading, Writing, Math, Social Studies, Science and overall goals. You will be viewing pieces of work that your child has selected to share with you to show their progress, strengths, and challenges. You may play a game or listen to your child read. You will likely see happy smiles and hear many positive comments about your child’s learning! The following questions could be used to help encourage your child to share more about their learning during their conference. You do not need to ask all of these, nor is it encouraged, as your child will lead the conference. However, these are meant to be a guide to encourage and support your child to be thoughtful with their reflections. How have you grown in this area? How can you improve in this area? How can we help you at home? What was important to you about this? Why does this piece of work make your proud? What did you learn from completing this piece of work / project? What was most challenging about completing this work / project? If you could do this work over, what might you change? What goals do you have as a learner? AISB’s After-School Activities Program has grown and evolved considerably in the past few years. Our Self-Study process reiterated a belief has actually been in the air for some time and that is expressed clearly in AISB’s educational goals for the Strategic Plan: it’s important that we align all our programs closely with our Mission. In that way, we ensure that our many programs and initiatives work together to support student learning. To this end, the school has written a much-needed Statement of Purpose for the ASA program. The Statement clarifies the purpose and function of the Program, and explains the role of after-school activities in supporting student growth and well-being, and in community-building. We invite you to investigate! You’ll find the ASA Statement of Purpose here. We are so proud of our seniors but they all know that their work is not done. 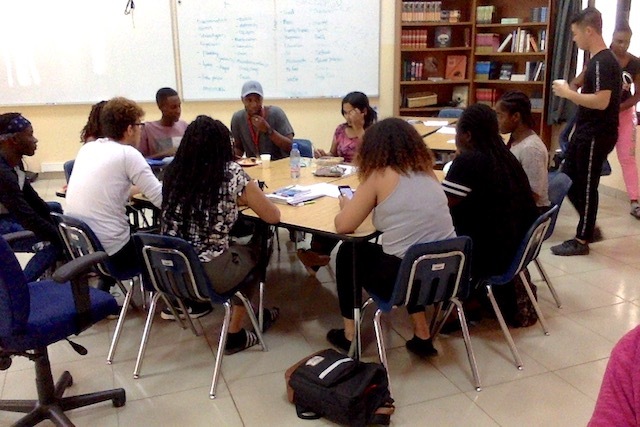 They are working hard to finish the year strong to fully get ready for their University experience. Recognizing academic achievement is one of the ways that AISB celebrates students’ commitment to engaging with challenge. To really commit to academic achievement takes courage and strength. We are proud our students’ achievements, and we are equally proud of their courage, their vision and their growth as learners. We also recognize that our students are growing and achieving not only as individuals but also as members of a supportive community: our students are a community of learners who are becoming better and better at helping one another learn. Especially in a small school like this one where we know one another well, we know that there are many kinds of challenge in school, and in life. Think of the student who starts something new for the school that benefits everyone, or the steadfast good friend always there during tough times; the student who stands up for what she believes in, or argues it out until he makes his point; or the one who “gets it” and forgoes her own homework to help another student struggle with his – these students make important contributions to our community that also take courage and strength. AISB has always known this. In fact the Profile of Graduates says that the purpose of an education at AISB is not only to help students achieve excellence academically but to help students become a certain kind of person, who values caring, cooperation and citizenship as integral parts of a whole person. So how do we recognize these sorts of achievements, these contributions to our community? In recent years AISB has been working to find ways to recognize students for more than just high GPAs. Feedback from students suggested: a) that students agree that it’s important to recognize challenges and achievements beyond just academic ones; and b) that student also appreciate when we recognize achievement in special ways. Furthermore, teachers felt strongly that students needed to be part of the process of recognizing and honoring achievements and contributions to the community. Student voice is valued here; it’s their school. And who knows better about where the real challenge lies, than students do? Beginning this semester AISB is expanding the way we honor student achievement, to incorporate more elements from our Profile of Graduates. Anyone, student or teacher, can nominate for the Profile of Graduates Award a member of the community who, by their actions, makes an extraordinary contribution to the community, in any of the areas described by the AISB Profile of Graduates. We encourage students to step forth to nominate; and a student can also nominate himself or herself. To nominate someone, a student writes a short nomination, explaining what the person did or does, and how that is example of exactly what the Profile of Graduates is aiming for. This can include academic achievement, of course. The nomination will be read out, by the student or an appointee, in a formal ceremony near the end of the school year, and the person nominated will receive an award. Celebrating diversity in learners: we invite you to join in! We are hoping that this new award will help AISB honor the many ways that students learn and grow, and the many different kinds of contribution it takes to make a successful small community like this one. We invite you to take part! Students: look around! Which of our students, what good acts, great ideas, contributions of all sorts need to be recognized? Parents: help your child recognize the great things about him or her that go beyond academics. Help him see how being a great friend, like he is, makes a real contribution to the world; help her see how her courage in tough times will help her, and others, all her life. Parents will also be welcome to attend the celebration. Educators know that having well-developed literacy skills in our first language, or mother tongue, is vital for learning subsequent languages effectively. And beyond its practical purposes, children should know that their mother tongue is important -- to them, and us all: that it is beautiful, an essential part of themselves and their identity, and one of the keys with which they will unlock the world of meaning around them. March 12-16 was Mother Tongue week at AISB. We encourage you to make time at home for your child’s mother tongue. Stories, songs and books are great ways to help your child learn, and learn to love, his or her mother tongue. Spend time with others who speak the same language. Encourage your child to write a journal in his or her mother tongue. Watch a movie! Listen to the radio. Play games. Have fun! And help your child build this important understanding of language and identity. If you have questions about mother tongue or your child’s language learning, please be in touch with the ESOL department or your child's teachers. Mother Tongue Library: We need your help. One way to increase mother tongue literacy is to encourage children and families to read and write in their mother tongue. AISB has been gradually accumulating Mother Tongue Library, for families, students and teachers to access. We are seeking your help. If you have books in languages other than English that you have loved and are ready to pass on to another home, please consider donating them to our Mother Tongue Library. All donations can be dropped off at the front office with Ms. Oumou. 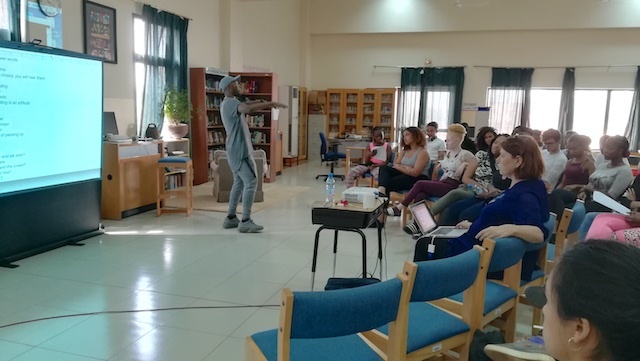 Secondary students had a chance to sample some poetry from visiting Dutch poet Elken Keine. 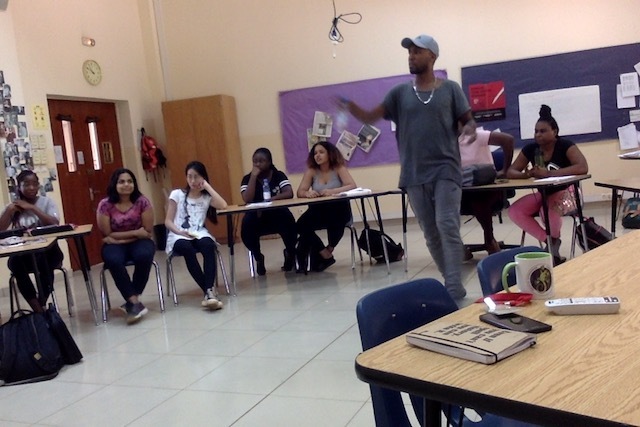 He later had a workshop and luncheon with grade 11 and 12 students. 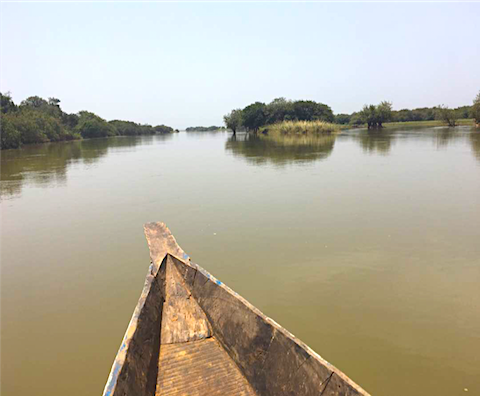 On Friday, March 2nd, the 9th grade African History class escaped the heat and took a pinasse ride on the mighty Niger River. The class pretended to be Mungo Park while enjoying snacks, reading and discussing Park’s trip. The reading was dense, as it was written in 1803, but the students were able to better understand the text by observing our surroundings, and putting ourselves in Park’s shoes/boat/or on his horse. Learning about both imperialism and colonialism has allowed the students to better understand the Africa that we live in now. History is the study of the past, but history should force us to think about the way things are now and how we can make them better in the future.